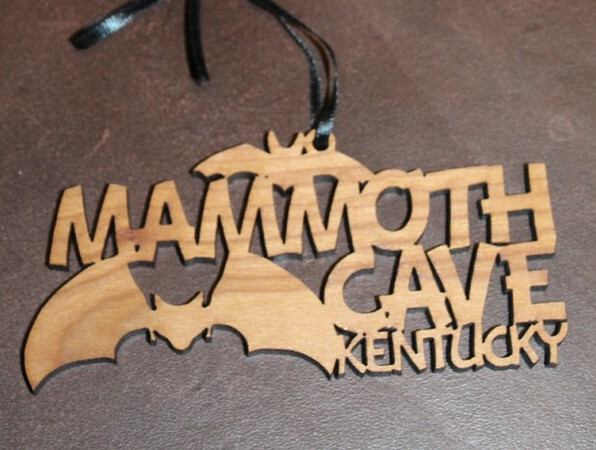 In April, we visited Mammoth Cave for the 3rd time. The first time, Anderson and Reagan were tiny babies. She fell on the way down and was upset and the cold temperature must have upset Anderson so he was also fussing. We stayed down there for about 3 minutes before heading back up. The next visit was in 2015 on our road trip with the Wilsons. We made it to the cave after closing time so we weren't able to see all of it but we were able to go down inside a tiny bit of the cave-enough that we counted it as a cave tour and were pleased with our stop. This time, we were able to tour the cave and walked quite a bit of the cave area. The kids were pretty interested in the guide at the bottom and we stayed a bit to listen to him talk. I guess the third time was the charm for buying an ornament at the cave. Here is the link to that trips post.